This year’s international week will focus on how the community can tackle the UN Sustainable Development Goals. Established in 2015, the UN Sustainable Development Goals (SDGs) strive to build a better world for people by 2030 by promoting prosperity in all countries while taking care of the environment. These 17 goals include eradicating poverty, quality education, reduced inequalities, and clean energy. “The Sustainable Development Goals are basically 17 goals that take a big picture of all of the areas of life, [and asks] how can we make sure our most marginalized peoples are being raised up and [are] having an equitable opportunity,” said global education coordinator Carrie Malloy. Before the days of podcasts and TED Talks, InternationalWeek began in 1986 as a small event designed to inspire discussion and newthoughts on current global issues at a local level. “Most people [at the time] didn’t have internet. You couldn’t just turn on a podcast and hear people from around the world speaking. So, it was a really unique event where we could bring in speakers to talk about really interesting global issues,” Malloy said. This year, the Global Education Program will be partnering with the University of Alberta Sustainability Council, the City of Edmonton, and MacEwan University to present one of the keynote speakers: Amy Luers. Luers is the executive director of Future Earth, an international research initiative on global sustainability and global environmental change, as well as a published scholar in both academic and popular media. Her keynote lecture, “Sparking Exponential Climate Action” will be on February 6 and will focus on the thirteenth SDG: climate action. One way International Week will cover the SDGs is through lighting talks called the “Global Goals Talks” that will be held in SUB Atrium, Monday through Thursday from 4 to 6 p.m. Each speaker will cover various SDGs within 17 minutes. 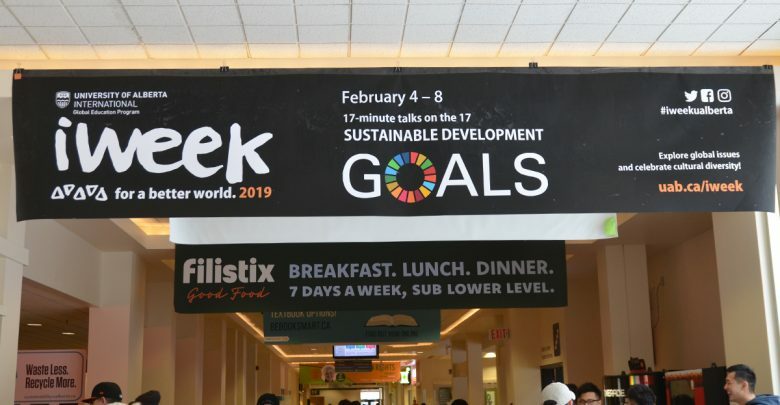 Following these “Global Goals Talks,” International Week will move to the lobby of the Myer Horowitz Theatre from 6 to 7 p.m. for live music, snacks and drinks, shortly before the evening’s keynote speaker commences in the theatre at 7 p.m. Tickets for the keynote lectures are available for free on the UAlberta website.